Dramatic events that shaped the history of California are portrayed by novel and interesting new displays in downtown Monterey. With more Mexican-era adobe buildings preserved and restored in Monterey State Historic Park than anywhere else in the state, the city is proud of its heritage as the early capital of California. In late 2018, I visited two recently renovated public projects that present this history in memorable ways. A popular mosaic mural portraying scenes from the city’s past with a strong dash of humor has returned to the rear of the rebuilt Monterey Conference Center. 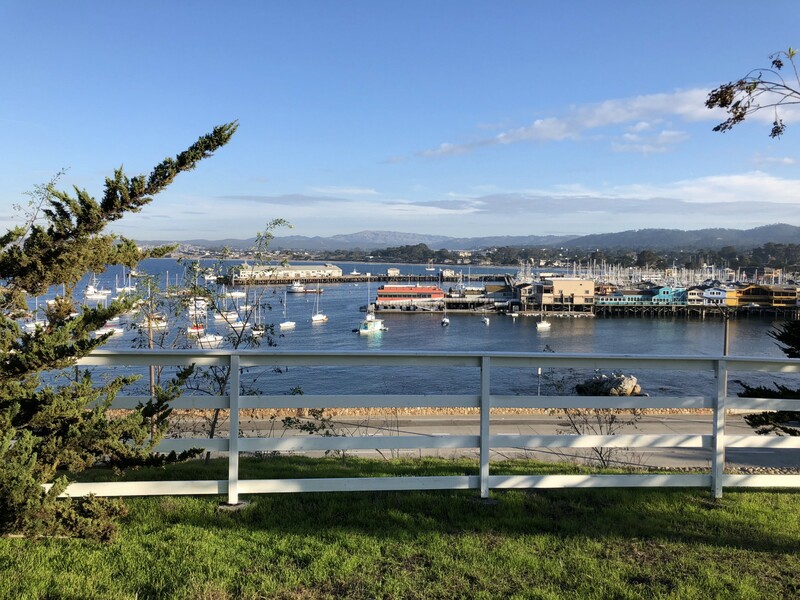 A short distance away, in a little-known and long-neglected public park with spectacular views of the bay, a new walkway links a series of monuments and interpretive signs that bring to life the stories of Monterey’s first people, the Spanish landings, and a seaborne invasion that briefly raised the flag of Argentina over California. 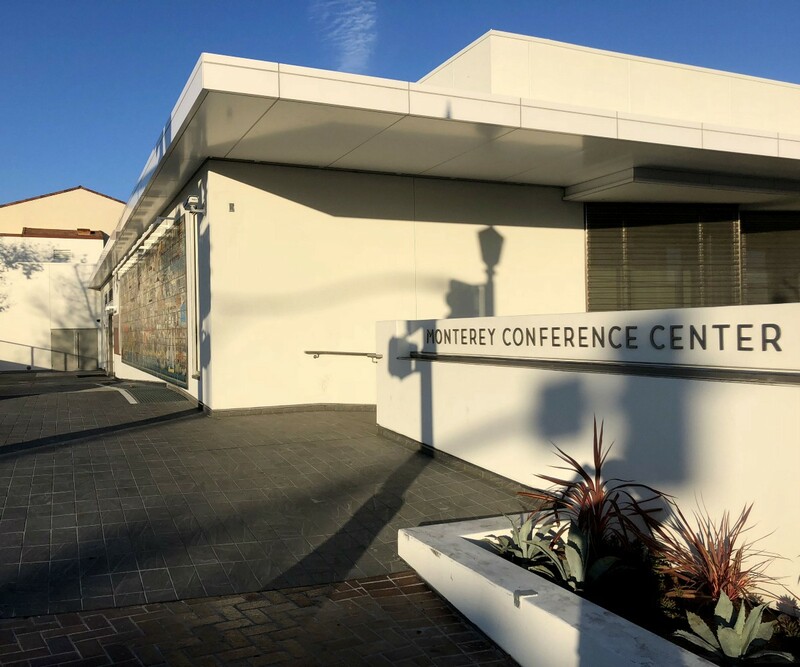 From the main entrance of the Monterey Conference Center at 1 Portola Plaza, I walked a short distance up the hill to the corner of Pacific Street. Here, just a few yards off the Path of History, facing historic Casa Soberanes (aka The House of the Blue Gate), “The Monterey Mural” offers a colorful and entertaining presentation of local history. 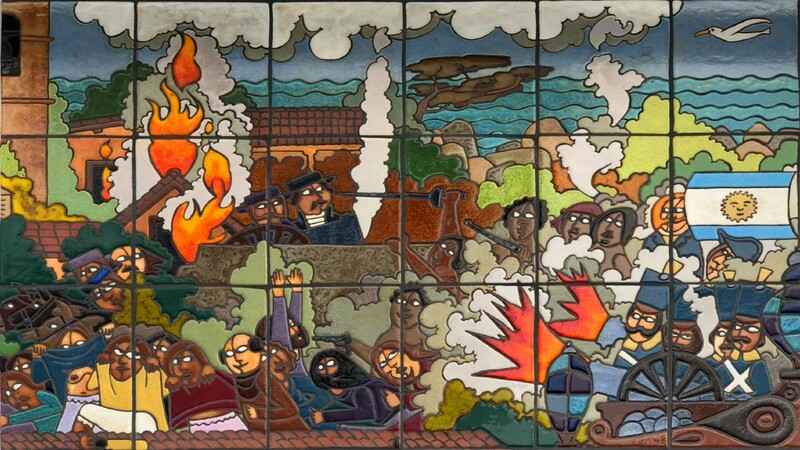 Mounted on the rear wall of the Center, a 45-foot by 11-foot glazed-tile mosaic, created in 1983 by San Francisco born-artist Guillermo Wagner Granizo, tells the story of Monterey in a visually memorable fashion. He illustrates the lives and times of the citizens of Monterey in linked stylized vignettes. In chronological sequence from left to right Native American tule canoes, a Spanish galleon, Sicilian fishing boats, and modern recreational watercraft sail on the bay against a backdrop of scenes and buildings from a Rumsien village gathering to bustling Cannery Row. Unveiled in 1984, the mural became popular with residents. Many were sad to see it removed to make way for a new conference center. They were relieved to learn that each of the hand-painted tiles had been carefully detached and wrapped in protective foam for storage until they could be reinstalled on the completed project. As Granzio passed away in 1995, the city invited his son to set the first and last of the 633 tiles that were set on the new structure in 2018. According to city Museums, Cultural Arts, and Archives Manager, Dennis Copeland, the images combine “Monterey’s panorama of history with Granizo’s great sense of humor.” One typical detail that caught my eye, shows a hot-air balloon carrying three individuals who made significant contributions to the local economy. Crooner Bing Crosby instigated what is now the annual AT&T winter golf tournament; S.F.B Morse rebuilt the Hotel del Monte, now the Naval Post Graduate School, and founded the Pebble Beach Company; writer John Steinbeck immortalized the less-fortunate members of the community in his novels that today draw millions of well-heeled tourists to Cannery Row. Dozens of similar renderings attest to the artist’s thoughtful study of area history. Notable early visitors, including Dana, Fremont and Stevenson, gold miners on horseback, and livestock, arrive by galleon. Another, featuring an Argentinian flag and blazing cannons, refer to an event featured at my next destination. Now a city park with panoramic views of the ocean and harbor, the land served as a sacred site for countless generations of indigenous people before being occupied by the Army. Today the upper slopes are home to the Defense Language Institute Foreign Language Center (DLIFLC) while the lower section is leased to the City of Monterey. A free Presidio Museum of Monterey at the center of the park tells the stories of its military heritage. 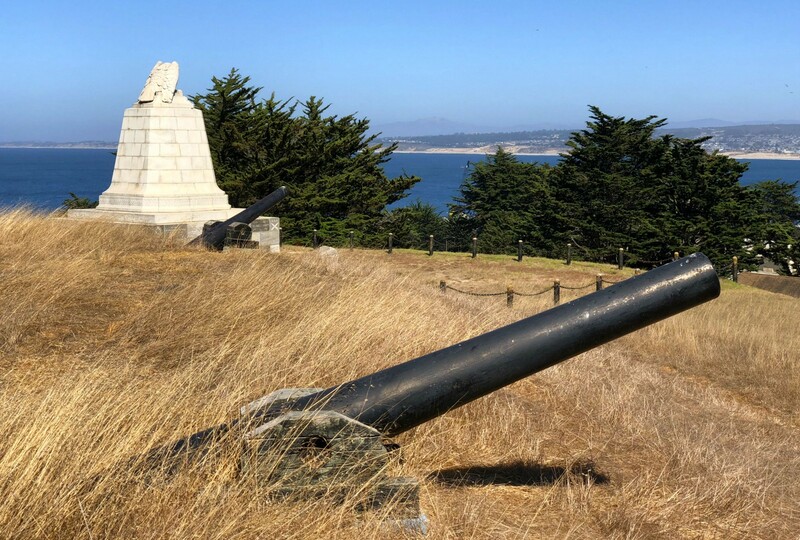 A battery of cannons and an imposing monument honoring navy Commodore Sloat, who seized the land for the United States in 1846, crown the ridge. A statue of Sloat originally planned for the monument was destroyed in the 1906 earthquake. Short of funds and time, the builders replaced him with a crouching granite eagle, sadly out of proportion with the mass of the base. Monterey negotiated a 50-year lease from the Army to develop this prime spot of real estate as a park in 1996. Although open to the public, city funds were never allocated for improvements. In 2017 the Old Monterey Foundation raised private donations to make the site more accessible and welcoming. Changes include removing a forbidding chain-link boundary fence, erecting new signage at the entrance, and paving an ADA wheelchair-accessible walkway between monuments lined with interpretive panels celebrating historic events that took place on the site. In addition to its historic aspects, a key attraction for locals is access to 25-acres of uncrowded open space for biking, hiking, running, walking, and yoga as well as games and picnics with spectacular views of the water together with acres of free parking. All just a few minutes stroll from downtown. I had been attracted to the park by a website proclaiming its lineage as “The Most Significant Historic Site on the West Coast.” This bold claim is based on its occupation for centuries by native Rumsien/Ohlone people, being the place where Sebastian Viscaino claimed the land for the King of Spain in 1602, where Father Serra landed to found the California mission chain, and the site of the only sea/land battle between sovereign nations in California history. I walked under the replica 19th century “Presidio of Monterey” white, wooden ranch-style entrance arch and up the hill to meet Monterey Bay historian and author Tim Thomas at the museum. 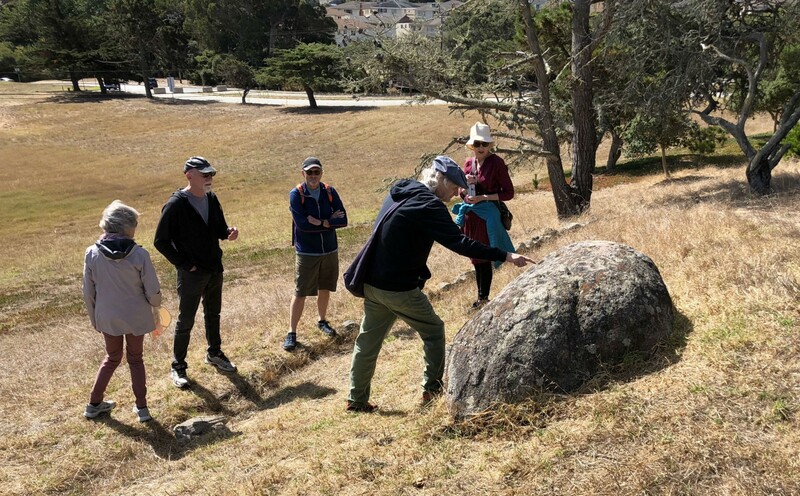 After reviewing exhibits of the park’s history, from the earliest inhabitants; through the Spanish and Mexican periods; to its role as a military training and education base, Tim led a walking tour of the site. We followed a new paved walkway to the Sloat Monument and defending cannons of the former Fort Mervine at the top of the hill. Our reward, a panoramic view across the city and bay to the distant Santa Cruz Mountains. Protruding from the grassy slope, Tim identified a large, rounded boulder as the Rain Rock. Flecks of red pigment remaining in some of the 43 holes ground into the rock by indigenous people, indicate that it may have served a ceremonial purpose, possibly to influence the weather. Back at the base of the slope, another new paved walkway led to a promontory overlooking the harbor. Interpretive panels placed close to the path insure convenient access for wheelchair-bound visitors. In the shade of a young cypress tree, Monterey’s First People, described the Esselen and Rumsien Ohlone tribes who had inhabited the area for thousands of years before the Spanish mission system devastated their culture. 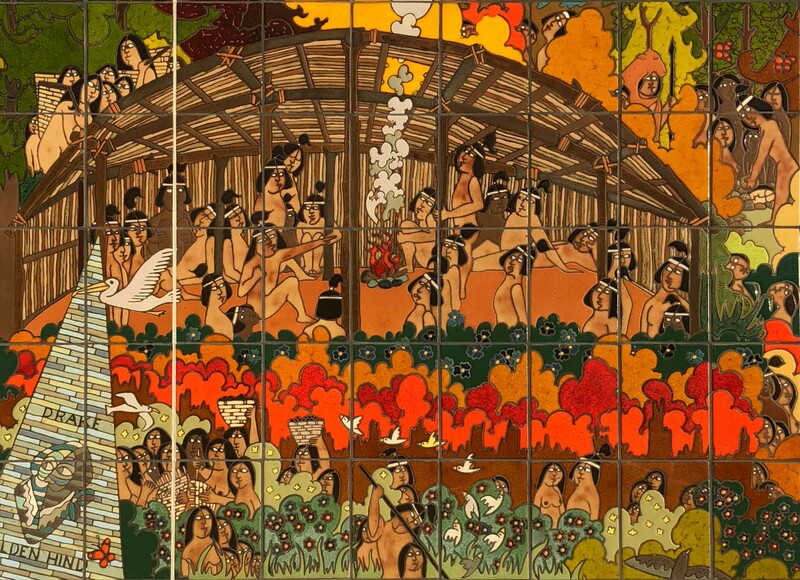 A sketch depicts the willow and tule-thatched dwellings, called ruks, that Granzio included in his mural. The next panel, Hippolyte Bouchard Monument, tells the story of Captain Hippolyte Bouchard, a Frenchman loyal to the newly free nation of Argentina who was authorized as a privateer to plunder ships and ports of their former colonial maser, the King of Spain. In November 1818, he sailed two armed vessels with a force of 400 men into Monterey Bay. Nearby, a granite bolder placed by an Argentinian organization in 1979 bears a bronze plaque titled La Armada Argentina to commemorate the bicentenary of the birth of Bouchard. Behind the plaque, a flagstaff flew the blue and white colors of his country. According to Thomas, Bouchard demanded “the surrender of your city with all the furniture and other belongings of the King. If you do not do so the city will be reduced to cinders.” Spanish Governor Sola’s refusal to negotiate culminated in a barrage of cannon fire from both sides. Bouchard landed troops near Pacific Grove and attacked from the rear but by then the inhabitants had evacuated inland to safety. Unable to find any civilians to convert to the anti-Spanish cause, he looted and set fire to the vacant buildings and departed, empty-handed, 6 days after raising the flag. 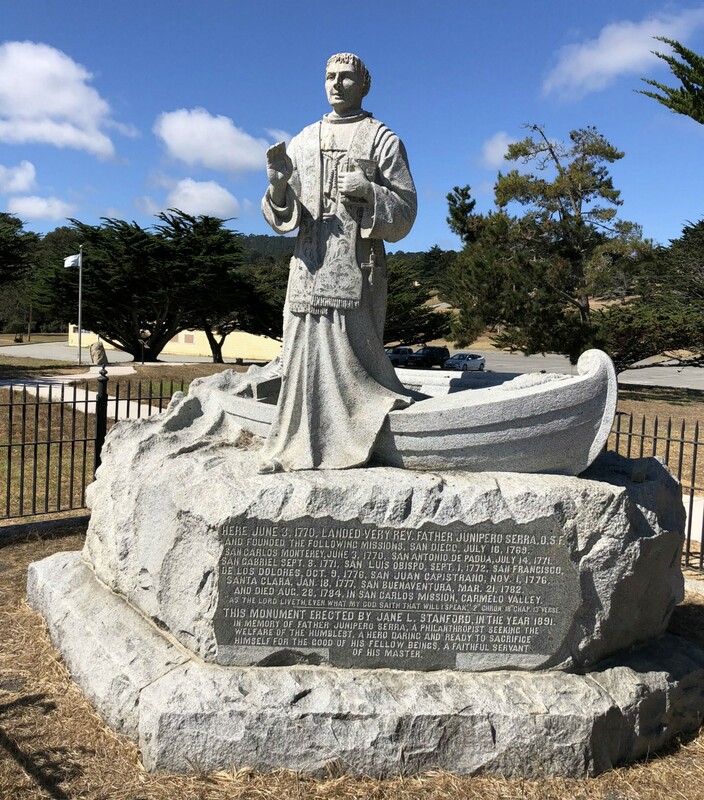 A life-size granite sculpture erected in 1891 depicts Franciscan Father Serra’s arrival on the shore immediately below this site to establish a mission in 1770. Jane Stanford, of Stanford University, commissioned John Combs to create the monument. The Junipero Serra Monument panel notes criticism of Serra’s role in suppressing the culture and spreading disease and suffering among the Native Americans. Angered by Serra’s canonization to sainthood in 2015, someone decapitated the statue. His severed head was found by the ocean and reunited with the body. 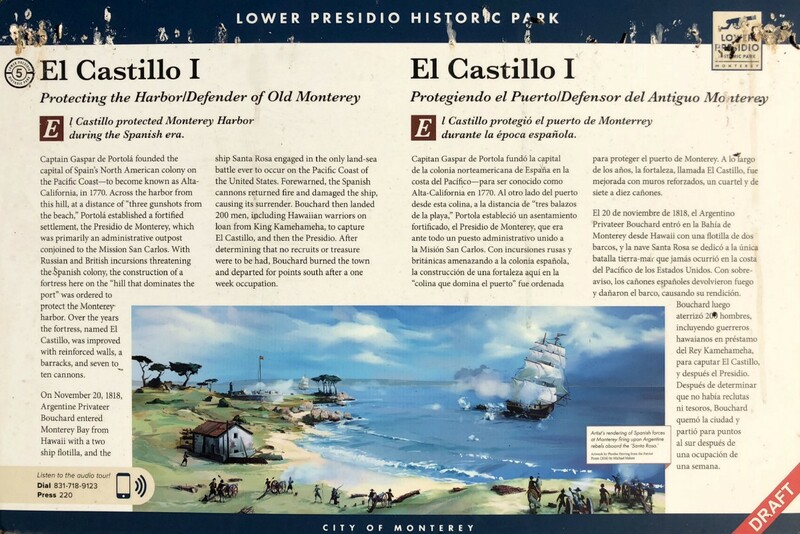 Two final panels identify the location of the fortified walls of El Castillo that held up to 10 cannons to repel feared British and Russian incursions early in the Spanish occupation. In 1818 Spanish gunners fired and disabled one of Bouchard’s vessels. The cannons fired again in 1842 but failed to deter an American invasion. Commodore Thomas Catesby Jones mistakenly believed that U.S. was at war with Mexico. Advised of his error, an embarrassed Jones apologized and sailed quietly away. Each panel provides a phone number (831–718–9123) to a free self-guided tour for audio recitation of the information. Smart phone users can also access a website with additional images, text, and audio on these and other historic sites throughout the city. 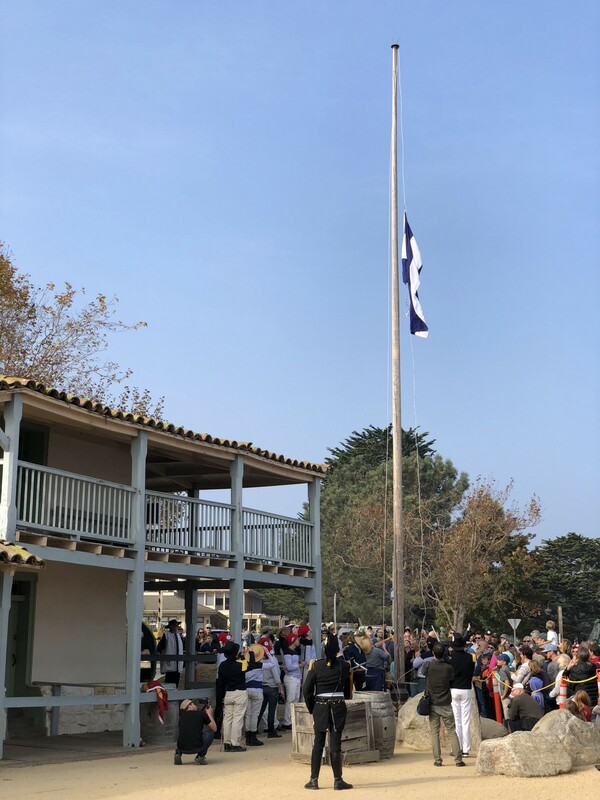 On Saturday, November 17, 2018, I returned to Monterey to participate in the 200th anniversary of the Bouchard attack. Hosted by the city museum and cultural arts commission, events included talks at the Middlebury Institute of International Studies on the history and politics of the era followed by a reenactment of the battle. Led by Captain Bouchard (played by actor Howard Burnham), privateers, accompanied by cannon fire, disembarked from La Argentina (the tall ship Lady Washington in the role of Bouchard’s vessel) and rowed to shore near Fisherman’s Wharf. 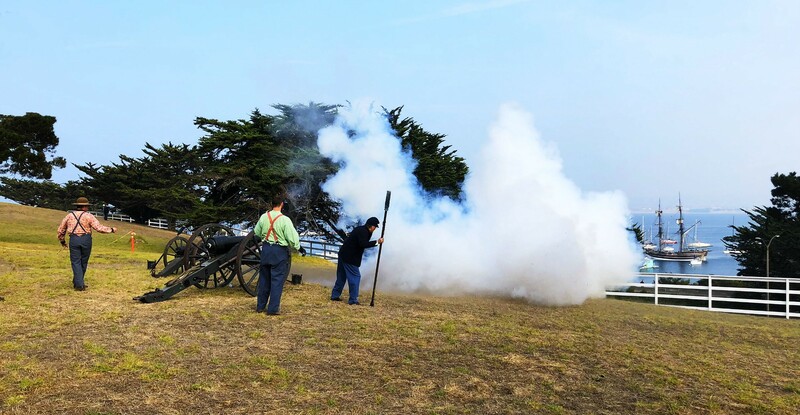 Echoing blasts and smoke responding from defending cannons on the Lower Presidio Historic Park delighted every small boy and terrified every dog in attendance. On landing, the invaders stormed the Custom House and once again raised the blue and white flag of Argentina over California. Hurling insults at their Spanish overlords, Burnham regaled the crowd with an over-the-top performance as an arrogant Bouchard. Residents were relieved that the invaders refrained from attacking and burning the town on this occasion. 1] Books on the events of 1818 include the The Burning of Monterey (2001) by Peter Uhrowczik and The Patriot Pirate (2016) by Michael Melzer.